This article is about the electromagnetic phenomenon. For other uses, see dipole (disambiguation). The magnetic field of a sphere with a north magnetic pole at the top and a south magnetic pole at the bottom. By comparison, Earth has a south magnetic pole near its north geographic pole and a north magnetic pole near its south pole. 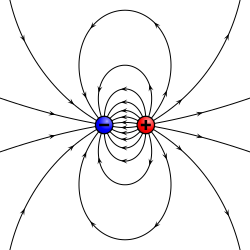 A magnetic dipole is the closed circulation of an electric current system. A simple example is a single loop of wire with constant current through it. A bar magnet is an example of a magnet with a permanent magnetic dipole moment. For the magnetic (dipole) current loop, the magnetic dipole moment points through the loop (according to the right hand grip rule), with a magnitude equal to the current in the loop times the area of the loop. Similar to magnetic current loops, the electron particle and some other fundamental particles have magnetic dipole moments, as an electron generates a magnetic field identical to that generated by a very small current loop. However, an electron's magnetic dipole moment is not due to a current loop, but to an intrinsic property of the electron. The electron may also have an electric dipole moment though such has yet to be observed (see electron electric dipole moment). Contour plot of the electrostatic potential of a horizontally oriented electrical dipole of finite size. Strong colors indicate highest and lowest potential (where the opposing charges of the dipole are located). A permanent magnet, such as a bar magnet, owes its magnetism to the intrinsic magnetic dipole moment of the electron. The two ends of a bar magnet are referred to as poles—not to be confused with monopoles, see Classification below)—and may be labeled "north" and "south". In terms of the Earth's magnetic field, they are respectively "north-seeking" and "south-seeking" poles: if the magnet were freely suspended in the Earth's magnetic field, the north-seeking pole would point towards the north and the south-seeking pole would point towards the south. 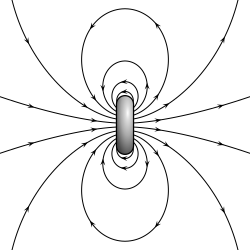 The dipole moment of the bar magnet points from its magnetic south to its magnetic north pole. In a magnetic compass, the north pole of a bar magnet points north. However, that means that Earth's geomagnetic north pole is the south pole (south-seeking pole) of its dipole moment and vice versa. The term comes from the Greek δίς (dis), "twice" and πόλος (polos), "axis". Electric field lines of two opposing charges separated by a finite distance. Magnetic field lines of a ring current of finite diameter. Field lines of a point dipole of any type, electric, magnetic, acoustic, etc. A physical dipole consists of two equal and opposite point charges: in the literal sense, two poles. Its field at large distances (i.e., distances large in comparison to the separation of the poles) depends almost entirely on the dipole moment as defined above. A point (electric) dipole is the limit obtained by letting the separation tend to 0 while keeping the dipole moment fixed. The field of a point dipole has a particularly simple form, and the order-1 term in the multipole expansion is precisely the point dipole field. Although there are no known magnetic monopoles in nature, there are magnetic dipoles in the form of the quantum-mechanical spin associated with particles such as electrons (although the accurate description of such effects falls outside of classical electromagnetism). A theoretical magnetic point dipole has a magnetic field of exactly the same form as the electric field of an electric point dipole. A very small current-carrying loop is approximately a magnetic point dipole; the magnetic dipole moment of such a loop is the product of the current flowing in the loop and the (vector) area of the loop. Any configuration of charges or currents has a 'dipole moment', which describes the dipole whose field is the best approximation, at large distances, to that of the given configuration. This is simply one term in the multipole expansion when the total charge ("monopole moment") is 0—as it always is for the magnetic case, since there are no magnetic monopoles. The dipole term is the dominant one at large distances: Its field falls off in proportion to 1/r3, as compared to 1/r4 for the next (quadrupole) term and higher powers of 1/r for higher terms, or 1/r2 for the monopole term. Many molecules have such dipole moments due to non-uniform distributions of positive and negative charges on the various atoms. Such is the case with polar compounds like hydrogen fluoride (HF), where electron density is shared unequally between atoms. Therefore, a molecule's dipole is an electric dipole with an inherent electric field that should not be confused with a magnetic dipole which generates a magnetic field. The physical chemist Peter J. W. Debye was the first scientist to study molecular dipoles extensively, and, as a consequence, dipole moments are measured in units named debye in his honor. These occur when two atoms in a molecule have substantially different electronegativity: One atom attracts electrons more than another, becoming more negative, while the other atom becomes more positive. A molecule with a permanent dipole moment is called a polar molecule. See dipole–dipole attractions. These occur due to chance when electrons happen to be more concentrated in one place than another in a molecule, creating a temporary dipole. These dipoles are smaller in magnitude than permanent dipoles, but still play a large role in chemistry and biochemistry due to their prevalence. See instantaneous dipole. These can occur when one molecule with a permanent dipole repels another molecule's electrons, inducing a dipole moment in that molecule. A molecule is polarized when it carries an induced dipole. See induced-dipole attraction. More generally, an induced dipole of any polarizable charge distribution ρ (remember that a molecule has a charge distribution) is caused by an electric field external to ρ. This field may, for instance, originate from an ion or polar molecule in the vicinity of ρ or may be macroscopic (e.g., a molecule between the plates of a charged capacitor). The size of the induced dipole moment is equal to the product of the strength of the external field and the dipole polarizability of ρ. The linear molecule CO2 has a zero dipole as the two bond dipoles cancel. Potassium bromide (KBr) has one of the highest dipole moments because it is an ionic compound that exists as a molecule in the gas phase. The bent molecule H2O has a net dipole. The two bond dipoles do not cancel. The overall dipole moment of a molecule may be approximated as a vector sum of bond dipole moments. As a vector sum it depends on the relative orientation of the bonds, so that from the dipole moment information can be deduced about the molecular geometry. For example, the zero dipole of CO2 implies that the two C=O bond dipole moments cancel so that the molecule must be linear. For H2O the O−H bond moments do not cancel because the molecule is bent. For ozone (O3) which is also a bent molecule, the bond dipole moments are not zero even though the O−O bonds are between similar atoms. This agrees with the Lewis structures for the resonance forms of ozone which show a positive charge on the central oxygen atom. An example in organic chemistry of the role of geometry in determining dipole moment is the cis and trans isomers of 1,2-dichloroethene. In the cis isomer the two polar C−Cl bonds are on the same side of the C=C double bond and the molecular dipole moment is 1.90 D. In the trans isomer, the dipole moment is zero because the two C−Cl bonds are on opposite sides of the C=C and cancel (and the two bond moments for the much less polar C−H bonds also cancel). Another example of the role of molecular geometry is boron trifluoride, which has three polar bonds with a difference in electronegativity greater than the traditionally cited threshold of 1.7 for ionic bonding. However, due to the equilateral triangular distribution of the fluoride ions about the boron cation center, the molecule as a whole does not exhibit any identifiable pole: one cannot construct a plane that divides the molecule into a net negative part and a net positive part. is the center of mass of the molecule/group of particles. In the case of open-shell atoms with degenerate energy levels, one could define a dipole moment by the aid of the first-order Stark effect. This gives a non-vanishing dipole (by definition proportional to a non-vanishing first-order Stark shift) only if some of the wavefunctions belonging to the degenerate energies have opposite parity; i.e., have different behavior under inversion. This is a rare occurrence, but happens for the excited H-atom, where 2s and 2p states are "accidentally" degenerate (see article Laplace–Runge–Lenz vector for the origin of this degeneracy) and have opposite parity (2s is even and 2p is odd). μ0 is the permeability of free space, measured in henries per metre. is a unit vector in the direction of r, p is the (vector) dipole moment, and ε0 is the permittivity of free space. where E is the electric field and δ3 is the 3-dimensional delta function. 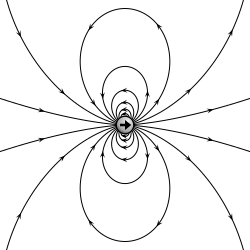 [note 2] This is formally identical to the magnetic H field of a point magnetic dipole with only a few names changed. In addition to dipoles in electrostatics, it is also common to consider an electric or magnetic dipole that is oscillating in time. It is an extension, or a more physical next-step, to spherical wave radiation. is not distributed isotropically, but concentrated around the directions lying perpendicular to the dipole moment, as a result of the non-spherical electric and magnetic waves. In fact, the spherical harmonic function (sin θ) responsible for such toroidal angular distribution is precisely the l = 1 "p" wave. Notice that the dependence of the power on the fourth power of the frequency of the radiation is in accordance with the Rayleigh scattering, and the underlying effects why the sky consists of mainly blue colour. A circular polarized dipole is described as a superposition of two linear dipoles. ^ Magnetic colatitude is 0 along the dipole's axis and 90° in the plane perpendicular to its axis. ^ a b δ3(r) = 0 except at r = (0, 0, 0), so this term is ignored in multipole expansion. ^ Griffiths, David J. (1999). Introduction to Electrodynamics (3rd ed.). Prentice Hall. ISBN 0-13-805326-X. ^ Griffiths, David J. (1994). Introduction to Quantum Mechanics. Prentice Hall. ISBN 978-0-13-124405-4. ^ "dipole, n.". Oxford English Dictionary (second ed.). Oxford University Press. 1989. ^ Weast, Robert C. (1984). CRC Handbook of Chemistry and Physics (65th ed.). CRC Press. ISBN 0-8493-0465-2. Electric Dipole Potential by Stephen Wolfram and Energy Density of a Magnetic Dipole by Franz Krafft. Wolfram Demonstrations Project.